Welshman Chaz Davies ended Kawasaki's winning start to the World Superbike season as he earned a dominant win over series leader Jonathan Rea in Aragon. Northern Irishman Rea, 29, won the opening three races in Australia and Thailand, with his Kawasaki team-mate Tom Sykes also taking a win in Buriram. 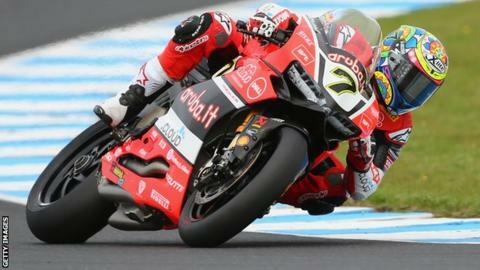 But Ducati's Davies, also 29, bossed Saturday's race in Spain, finishing 4.168 seconds clear, with Sykes third. Rea's second place extended his series lead from 29 to 33 points. Defending champion Rea now has 115 points, with Englishman Sykes on 82. Davies' victory, his 10th in the series, moved him up to third in the championship, two points behind Sykes. Dutchman Michael Van Der Mark dropped to fourth on 65 points after sliding off three laps from the finish on Saturday. Home rider Xavi Fores took fourth place in Spain ahead of Davies' Ducati team-mate Davide Giugliano, with 2006 MotoGP champion Nicky Hayden completing the top six on his Honda. This riders will be back in action in Race Two at the Aragon round on Sunday.